Two days after our successful trip through the Gjipe canyon we undertook another trip – this time we decided to cross the Karaburun mountains – which we could see from our apartment’s window – and spend the night on a beautiful and isolated beach of Ionian sea – “on the other side”. First, let me tell you a little bit about the geography of our intended destination. Karaburun (spelled also Karaburuni) is a range of low mountains that stretches for more than 30km, roughly between Dhermi in the south and in to the northern tip of Karaburun peninsula. The Karaburun peninsula which separates Adriatic and Ionian Seas closes off the Bay of Vlore to the south and can only be reached by either a boat or by a long walk in from Orikum. 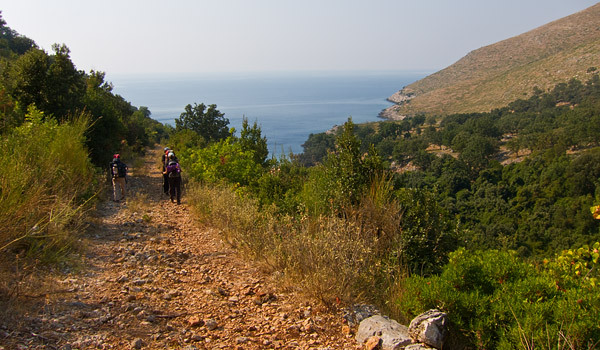 The Karaburun peninsula is completely undeveloped and offers a fantastic hiking opportunity in one of the loneliest parts of the Albanian Riviera. A part of the mountains is designated as a national park which is rich in wildlife, including deer, foxes, wild boars and even wolves. 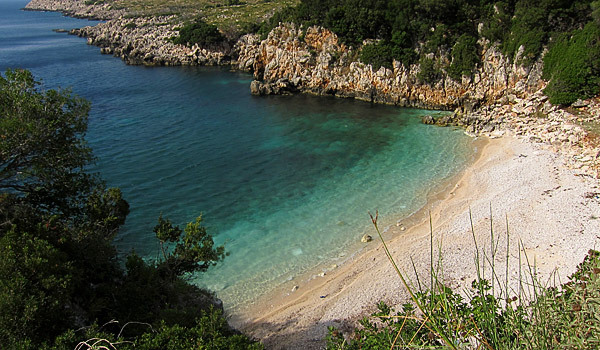 The area has many unspoilt pebble beaches and several fascinating sea caves. We decided to explore one such a beatiful spot. We set off for the trip early on Sunday morning. Thanks to the kindness of the local Albanian family who let us park in their backyard, we were able to leave our car close to the shepherd’s track at the foot of the mountains. It saved us about an hour of walking from our apartment in Orikum. We set off to go around the Pashaliman Lagoon in order to avoid the nearby naval base. The shepherds we passed seemed very surprised by our excursion. I could only assume what they might be thinking about – “what the hell are they doing here so early on Sunday morning carrying big rucksacks – strange people these tourists…”. There were moments – to be honest – that I thought the same, especially when we were wading through the tall thistles on our way uphill. It took us about two and a half hour to reach the top of the first hill. We took a long break as our rucksacks were really heavy: as well as tents, sleeping bags, food and so on we had to carry a sufficient supply of drinking water. Then another hour to reach the top of the last hill from which we could already see the “other side” and the Ionian sea. We could also see burnt grasslands and trees freshly darkened by smoke. Was it possible that Albanian people were still in the habit of burning off the grass which is not only useless as it doesn’t promote in any way growth of the vegetation making the soil impoverished but also very hazardous. After a short break, we started walking downhill dreaming of taking the plunge into the Ionian sea. I also heard our men companions daydreaming about how it would be lovely to take a few sips of cold beer when we got there – unbelievable. Finally after another hour of walking downhill we saw something we would never have expected, and not what we had been dreaming about from the moment we left our apartment. What we saw were two big 4×4 cars parked next to the beach, what the hell….? Yes, our supposedly empty beach was rather crowded. There were eight or nine people and also kind of a shaman’s hut, which meant that there might be probably even more. And all of this after five hours of hiking. We ended up on a beach even more crowded than the one close to our apartment. Too tired to pity ourselves, we left our heavy load on the beach and went swimming – at least the crystal blue waters of Ionian sea didn’t disappoint us. We got out of the water and spent the next two hours sunbathing and watching our unexpected neighbours. They seemed nice and friendly. Later we noticed that they were packing up their gear and probably they were about to leave. We decided to ask them if they had any water left, as we were running lower on supplies than expected. To our surprise they handed over to us not only some water but also something that took our breath away – especially the male contingent of our team was overjoyed – straight from their portable fridge, they pulled out four cans of cold beer which were probably left-overs from their just-finished beach party – can you imagine? It could only happen here – in the Albanian Riviera. Nonetheless, we were very grateful for this unexpected supply of cold drinks. 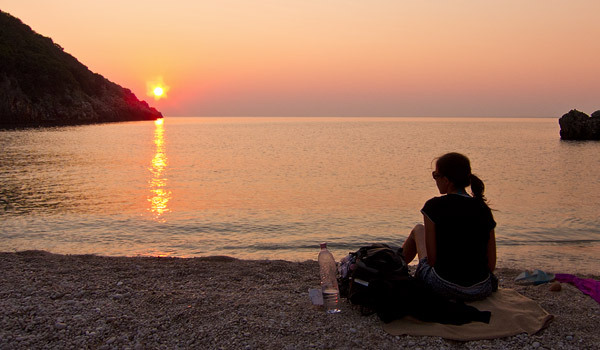 We pitched our tents, watched an amazing sunset over the Ionian sea and had a delicious supper. We could call this evening idyllic, if not for the fact that two neighbouring hills were literally on fire. And the fire was spreading rapidly over other parts of Karaburun mountains. If it hadn’t been real I would call it an amazing spectacle: here we are on an isolated beautiful beach and the fire is glowing high up on the hills above us. But it was real. It was so bright that we didn’t need to use flashlights. I didn’t feel scared, although I knew that we might well be in trouble. I was furious that we were not able to stop this habit of lighting grass fires. Fortunately, after a few hours the wind had changed and it diminished the fire. We went to sleep. We started the next day with a swim. The shaman didn’t show up in his hut so it was only us on the idyllic beach. The weather hovever was visibly worsening, there were more and more clouds coming and the wind became stronger. We had a breakfast and then a short nap to gain some strength before our trip back across the Karaburun mountains. Then we packed our rucksacks and got back on the track. We walked through the burnt fields of grass, the wind was getting stronger and a thunderstorm was rolling in. We reached the summit of the mountain in less than an hour. It was not so hot as on the previous day and we wanted to descend before the storm started. Paradise beach? It feels like, certainly one of many in the Karaburun peninsula. As we were walking down the last hill, the first raindrops fell. Soon it started to rain really heavily. We managed to find a shelter in an old shed. The rainstorm was right above us. After half an hour the rain stopped and we were able to continue our walk. During the last part of the trip we had a companion – a horse that probably got scared during the thunderstorm and broke his rope. He followed us, and just before we reached the place where we had parked our car the previous day, he sped up to a gallop and passed us by. He most likely was local to this area and headed home, so did we. After we got home the thunderstorm and downpour re-started – it was coming and going for the next two days. At least it prevented further grassfires in the Karaburun mountains, yet at least for a few days. Length: ~11km each way, 22km both ways. Time required: ~4-6hrs one way – depending on your equipment and stamina. Difficulty: Very difficult, see the Disclaimer. 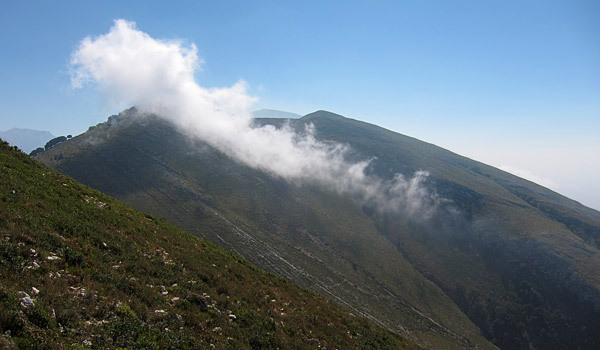 This walk is not marked in any way, and you have to depend on your experience when navigating shepherds’ tracks in a wild, bushy mountainous area. Not recommended for non-experienced walkers and badly equipped tourists. Things to take: Plenty of drinking water, food, light source, mosquito repellent, good hiking shoes, sun cream, sun glasses, a tent and sleeping bag if you’re planning to stay on the beach overnight. Alternative route – an alternative route is possible by the means of 4×4 vehicle. Available only with a special permission from the commendant of Pashaliman military base. Ask for details via Contact Us form.